Are you good at gardening? Do you have a big garden? I know that some of you do that. Since I am a German-American, meat and potatoes kind of guy, and since no one has figured out how to plant and harvest steak or pizza, gardening is not my thing. And I have told you that whenever Erica and I attempted any kind of garden, it croaked. Completely. When we look at the Parables of Jesus we want to be careful not to try and interpret every parable down to the last detail. Sometimes it is better to look at the bigger picture when we examine the parables of Jesus. In today’s Gospel, one thing that I think this Jesus is telling us is that we need to be patient. In our society, patience is something that is hard to come by. We get mad that it takes “so long” for the microwave to pop that popcorn or make that Pop Tart. Many folks have switched from charcoal grills to gas because it took too long for a fire to start the old way. (I am one of those people, but I got mine because I was tired of destroying beef.) We are an impatient people. It used to take, what, ten minutes to make a pot of coffee? Now we think the Keurig takes too long when it pauses for a “heat the water” cycle. Don’t believe me that we are impatient? Ask a teacher what it’s like when Christmas vacation or spring break or the end of the year rolls around. Ask them whether they can get anything done during those days. It’s hard because the students are incredibly impatient for their vacations. I have internet at my home that I can download a web page in about half a second. Cox wants me to get something called Gigablast that can download in a tenth of a second. I can save .4 seconds with every click! It is not surprising then that this mindset affects our spiritual lives as well. We want the full benefits of God’s gifts and we want it now! We want God to answer our prayers NOW. Many in the church also want to see immediate success with quick and easy growth. But it usually isn’t like that. Jesus tells us a story of a guy who had patience. It sounds like he planted his seeds then went about his day to day life. Each day he would get up for work, spend a long day at the office, come home, say hi to his kids, have a beer, watch some Netflix, go to bed, and the next day does it all again. He does not worry about the seeds, he doesn’t run out all the time to check on them. He knows they will grow in their own time. We do this too, in other things. When you put something in the oven, do you stare at it to make sure it is being cooked? No, right? Last Sunday Erica made lasagna. She put it in the oven and 30 minutes later we knew that we would have palate paradise. When you put your clothes in the washer, do you sit there for 45 minutes and watch them spin around and make sure they are getting washed? No, we assume it is going to happen without our inspection unless you are in Munich. So it is with the Word of God as it is preached, taught, studied, for it will ignite and strengthen faith, hope, and love. The Holy Spirit works in the hearts of people, and we know this is happening without seeing it. The Kingdom of God may grow slowly, in a way we do not understand, but by God’s power in His Word it WILL grow. The Bible tells us that Jesus, even with the burden of our salvation on His shoulders, took the time to interact in a one on one way with ordinary people, unimportant people, even outcasts. He never had a meeting with Caesar, or Pilate, or Herod in order to speed His mission up. What He came to do was going to get done. The sins of every person everywhere would be paid in full when He would go to the cross. The public demonstration of His victory over death would come too, not immediately, but three days later, in God’s good time. But it got done. We need to realize the power of God’s Word: the Words of our Lord spoken at our Baptism, the Words of our Lord spoken in Absolution and in Worship, the Words of our Lord spoken in His Holy Supper. We are to pray, to study and to trust in the powerful promises of God’s Word. We know, because God said so, that we will grow in our blessings. And when we share the Word and plant the seed, we may not see the results of that, but we can be assured that they will occur. Maybe not according to our timetable, but always according to God’s. Another big picture thing we have from this parable of Jesus is He reminds us that sometimes with small beginnings you get large endings. 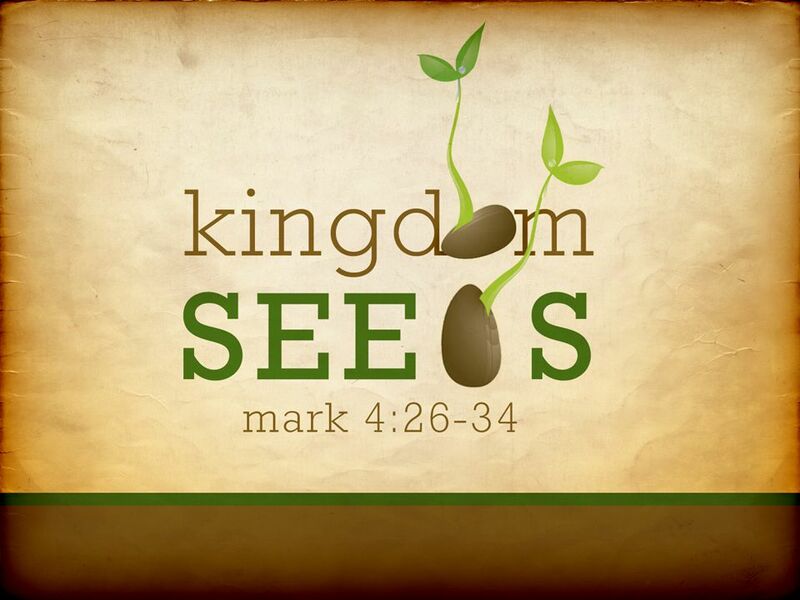 Jesus points us to an everyday miracle that takes a little seed and turns it into huge plants or trees. The tallest tree in the world, the California redwood, grows from a small seed. Jesus saw that the same thing was going to happen with His little band of twelve (well, eleven) common men and how that group would grow and spread throughout the world and number more than a billion people. We should not let the simplicity of the Gospel make us overlook its all-sufficient power to accomplish God’s purpose of salvation. 171 years ago, the Lutheran Church Missouri Synod began with 14 congregations and 12 pastors. They were scattered across the country from Buffalo, NY to St. Charles County, Mo. How could a small, far flung group like this hope to hang on, let alone grow? How could a bunch of German-speaking Christians make it in an English speaking country? Well, they did. A lot better than an English-speaking pastor did in their German-speaking country. God guided our Church and blessed it, and now it is 9000 pastors, 6000 teachers, 2 million members and 6000 congregations. And if we need more examples of the power of God’s Word, all we need to do is look at it some more. The most convincing and trustworthy examples of the power of God’s Word are found in the pages of the Scriptures themselves. In the next chapter of Mark (Chapter five) we will see Jesus casting out a demon and raising a dead girl to life again, all by the power of His Word. In John 4, by means of His spoken conversation, Jesus leads a woman, who in turn leads other Samaritans, to the simple confession of faith, “This man really is the Savior of the World.” (John 4:42) Peter preached one sermon on Pentecost and the Holy Spirit added three thousand souls to the church.